One of my coworkers is expecting her first grandchild any day now. 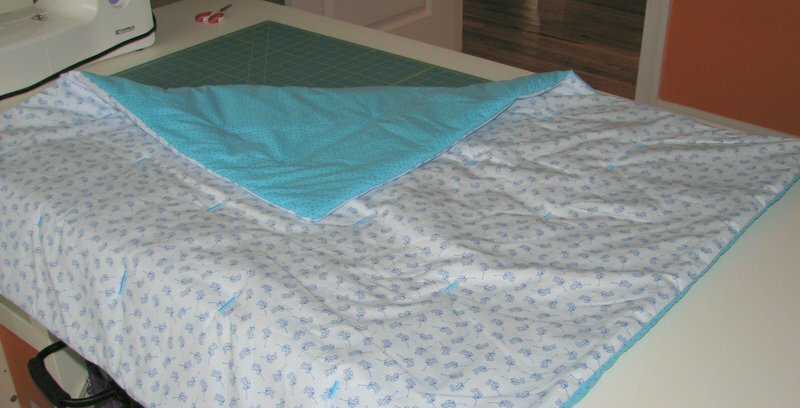 I decided to make another Super Quick +Easy Baby Quilt from Last-Minute Patchwork + Quilted Gifts by Joelle Hoverson, like Alannah’s Blanket. It’s a boy, but since I don’t know the baby’s name I’m calling this Yvonne’s Blanket (she’s the grandma). I found this cute teddy bears in wagons fabric and decided to use that for the front. Today worked out well for doing this, actually. My work schedule was switched around at the last minute and I’m working tonight with Yvonne, so I was able to get this done during the afternoon and I’ll bring it in to her tonight. There were a few things I would fix if I had more time, but I just wanted to make sure I had this to bring in before the baby comes. My label is right on the edge in the back, but I had to trim off a lot of fabric to square up the two pieces, and since I put the label on before sewing this together it ended up on the edge of all that trimming. I didn’t want a repeat of the batting getting flattened and felted together while trying to put on the label. I like the colors. I started out with a lot of other ideas, but I knew I wanted as much blue as possible. 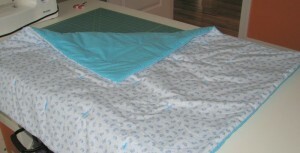 In the end, I used this aqua fabric for the back and quilted everything together with matching aqua thread. 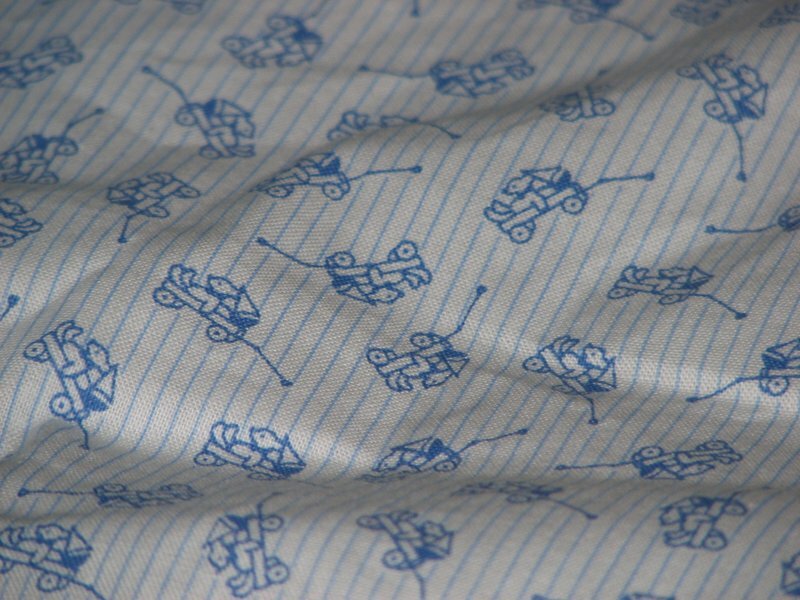 It’s not as traditional as it could have been with the front fabric, it’s kind of playful. I like that a lot.